It’s amazing how quickly kids grow up. It feels like only days ago I could hold Elisabeth in just one hand. Now she is nearly as tall as one of my best friends – admittedly my friend is 4ft10 so that is not a massive challenge, but Elisabeth is only six. And not only that, she has also lost her two front teeth to make room for her grown up ones! 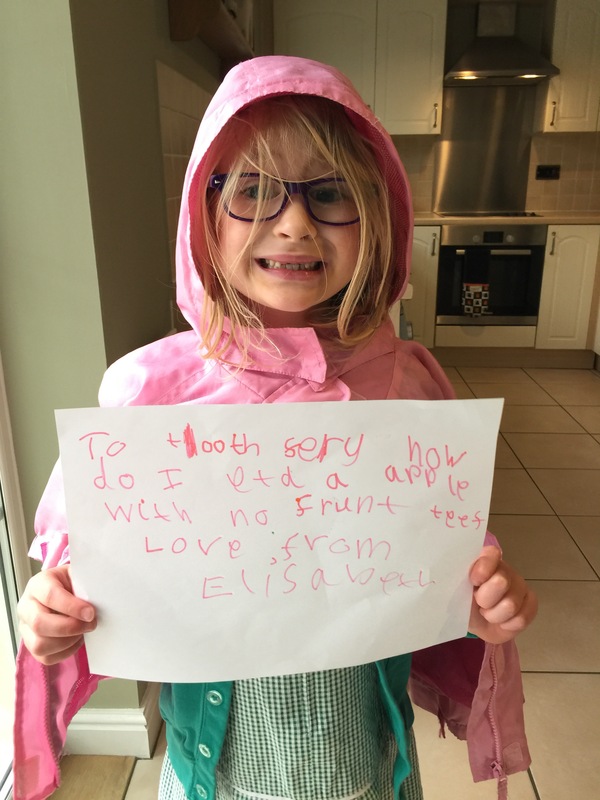 Elisabeth had her first wobbly tooth when she was 4. I was so not ready for this, I thought it wouldn’t happen until she was at least 6! Clearly I was wrong. Anyway, little 4 year old Elisabeth was very excited because when the tooth would come out the toothfairy would come! Wouldn’t it be lovely to just for a few days to go back to that world where there is a toothfairy, a Father Christmas and an Easter Bunny? The first few wobbly teeth were all excitement but the two front ones have been a bit troublesome. They took ages to come out and it hurt when she ate, dinner often ended up in tears until she as fed up with it and asked me just to pull it out! Brave girl. I had totally forgotten about the toothfairy! So there is me in my half asleep state, wobbling down the stairs to find some coins – please let me please have some coins!!! – and write a note from the toothfairy. Phew, close call. I can only imagine how distraught she would have been waking up and realising that the toothfairy had not come! To be so innocent again that your main concern of the day is how to eat an apple with no front teeth. So adorable! This is the solution: cooked apple! Some applejuice is a saucepan, add little pieces of apple and cook it slowly for 10 minutes. Before it starts burning add some more apple juice. Funnily enough, that’s what the toothfairy said, ha ha.